The construct of the quality of life (QoL) deals with subjective well-being and includes somatic and psychological components such as emotional well-being, awareness of one’s skills and disability, possibility of satisfactory sleep and rest, energy and vitality, and general satisfaction about one’s life [1, 2]. In a person suffering from a chronic disorder, QoL is influenced by severity and duration of illness, the side effects of medication, and the stressful events that interfere with the course of the illness [3, 4]. The subjective perception of the quality of life is now considered a construct of relevance for measuring the outcome of chronic disease , particularly for those having a great impact on the daily life of individuals and their relatives . Consequently QoL has become central to evaluate the efficacy of treatments . The most severe psychiatric disorders are chronic; these include several factors that can potentially impair the quality of life. Moreover the disorder-related stigma influences subjective QoL more than in other diseases . One of the most stigmatizing elements in psychiatric disorders is the feeling that not only is the subject incurable, but also that his/her disabilities are irreversible, such belief having been found deeply rooted in public opinion but also in caregivers . Sport is socially accepted and doing sports is collectively seen as a symbol of physical and psychological wellbeing. This is why it could serve as a strong antidote against the stigma . Physical exercise and sports activities have often been used as a tool for the rehabilitation of patients with severe psychiatric disorders  but never before our research project  were they investigated through a randomized controlled trial by means of standardized assessment tools. In a previous study we have shown how a program of learning to sail and practicing improved the clinical symptoms and social skills of a group of patients with chronic psychosis . The purpose of this paper is to illustrate how this same program has also improved some components of the quality of life, a construct linked to a modern vision of recovery, in people with severe psychosis . The study was supported by the Sardinian Regional Authority and the study protocol was approved by the Board of the “Centro di Programmazione della Regione Sardegna” (Planning Center of the Region of Sardinia) and by the Institutional review board of the Università Europea del Mediterraneo ONLUS. The study procedures were in agreement with the 1995 Declaration of Helsinki (revised in 2004 in Tokyo). Informed consent was obtained from all the participants. The methodology (randomized controlled, crossover clinical trial) and the timing of the study have been described in detail in the previous publication about this study . The two cross over arms were: a) rehabilitation with sailing plus current drug treatment in the first year and (in the second year) current drug treatment plus traditional rehabilitation program with self-help group discussion and work therapy; b) in the first year, traditional rehabilitation program (similarly to the second year of the first group) plus current drug treatment; and the sailing program in addition to current drug treatment in the second year. The 40 participants were required to have a diagnosis of schizophrenia, affective psychoses, or severe personality disorders , to have been for no less than two years in treatment in a mental health care network, and to have reached clinical remission without any crisis in the past four months. Recruitment, randomization methods, and issues concerning blinding have been already described as well . The description of the program including bi-monthly sailing cruises in the Gulf of Cagliari and lessons about sailing ships and sea life have also been detailed in the previously cited publication, as was also the equipment of the boat – including a hydrophone for recording or listening to underwater sounds with particular attention to the movements of shoals of cetaceans. Quality of life was evaluated on a 6-month basis since baseline with the WHOQOL-Bref. The WHOQOL-Bref is an abbreviated version of the WHOQOL-100 quality of life instrument  which construct of quality of life is consistent with that of the WHO: "the value assigned to duration of life as modified by the impairments, functional states, perceptions, and social opportunities that are influenced by disease, injury, treatment, or policy" . WHOQOL-Bref measures four components of quality of life as physical health, psychological health, social relationships and environment . The Italian version adopted in this survey shows satisfactory psychometric properties . The items are coded on a 5-point Likert scale. The range of scores is 4 to 20 for each component, higher score indicating better quality of life. All 3 raters had two years or more of professional experience with people suffering from severe mental disorders. They were trained in the administration of WHOQOL-Bref. The measure of intra-class correlation (ICC) coefficient at baseline did not change in repeated assessments over time. The Statistical Package for Social Science 17 (SPSS) for Windows was employed for data analysis. Because of multiple testing, tests were two-tailed; threshold of significance was set at p < .0001 according to Bayesian interpretations, to have the highest chance of confirmation in future studies . To test sample differences Student’s test for mean differences was adopted. A general linear model (GLM) that accounts for repeated measurements over time was used. Greenhouse-Geisser was applied to account for violation of sphericity. Baseline socio-demographic and clinical characteristics of the patients enrolled in the study. Group A refers to the group that participated in the dolphin-finding expeditions during the first year of the study; Group B refers to the group that participated in the dolphin-finding expeditions during the second year of the study, and served as a control group for Group A. Changes over time in measures of quality of life (The figure shows the groups in the time sequence of the cross-over design). In Group A, 2 participants dropped out, one in the second month and the other in the third. In Group B, 5 participants dropped out in the 13th month (one month after the start of the sailing program for this group). 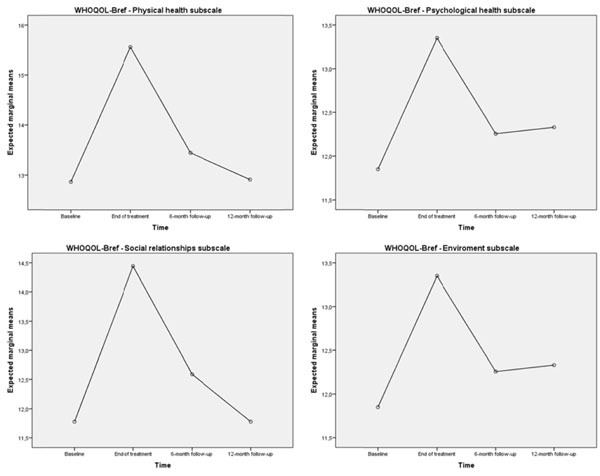 There was a statistically significant (Table 2) effect of time by group (treated cases versus controls) on WHOQOL-Bref Physical health subscale, F(1, 68) = 63.90, p < .0001 (partial eta-squared = .48); Psychological health subscale, F(1, 69) = 10.65, p = .002 (partial eta-squared = .13); and Environment subscale, F(1, 69) = 34.17, p < .0001 (partial eta-squared = .33), but not on the WHOQOL-Bref Social relationships subscale, F(1, 69) = 0.49, p = .48 (partial eta-square = .01). According to the effect sizes of the effects (partial eta-squared), changes in the Physical health and the Environment subscales were more important than the changes in the Psychological health subscale. 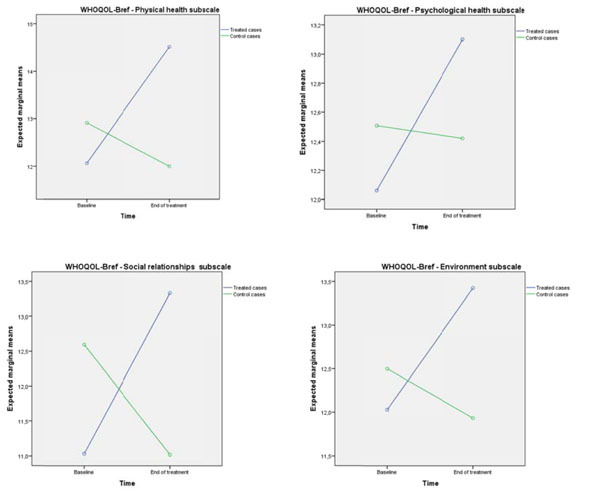 However once the program came to an end the effects disappeared, and in the subgroup for which we were able to collect data at the follow-up (n = 18) the scores on the four WHOQOL-Bref subscales measured at the 12-month follow-up returned back to the baseline values (Fig. 2). Distribution of scores on the WHOQoL-Bref by subscale at baseline and at end of treatment in treated cases and in controls. Distribution of scores on the WHOQoL-Bref by subscale at baseline, end of treatment, 6-month and 12-month follow-up in treated cases. Trend analysis showed that a quadratic model (rising and then falling trend) had the best fit for the changes over time in the four WHOQOL-Bref subscales in the subgroup with data at follow-up (p < .001 or lower). The people with severe mental disorders who participated to a “rehabilitation with sailing” program that included a series of cruises in the gulf of Cagliari (Sardinia), showed a statistically significant improvement of their quality of life and, as already indicated, of their clinical status and general functioning as well . The changes in the Physical health and and the Environment components of QoL were more important than those concerning Psychological health, while Social relationships did not improve at all. QoL improvement was not stable at follow-up: after 12 months patients showed a worsening trend for their quality of life in line with their baseline values’ returning to the scores achieved on the psychopathology and functioning scales in the previous study . Strong evidence supported by literature shows that exercise is significantly beneficial to people with severe mental disorders on both the biological and the psychological levels [19, 20]. Not only did exercise reduce psychopathological symptoms, but it also improved metabolic responses and neuro-protection, and increased QoL . Due to this evidence the proposal was advanced of integrating physical activity into a patient's social life in therapeutic regimes within the context of multi-modal therapeutic programs, as a strategy to improve the quality of live and reduce physical illness . The gradual transition from traditional neuroleptics to atypical neuroleptics in the current treatment of severe mental illness has facilitated, on the one side, the motor activity of the patient by reducing the incidence of extrapyramidal effects; but on the other it makes the patient more vulnerable to weight gain and dysmetabolic syndrome . Thus with the current treatment regimens, patients can more easily make physical activity, since the same new drugs making exercise more accessible also produce undesirable symptoms that are mitigated by exercise . However, the improvement in quality of life produced by sailing in our sample certainly depends upon more general and complex aspects although it may have a relationship with the improvement of body awareness and of the physical skills of participants, as emerged specifically from the physical scale. The concept of QoL is related to the subjective view of one’s satisfaction, thus the net improvement felt by patients during the rehabilitation of our sample could not be just a consequence of the improvement in symptoms and in skills due to physical activity only. The psychological health subscale, which shows a clear improvement in the trials, measures dimensions such as positive feelings, self-esteem, thinking, learning, memory and concentration, spirituality, religion, and personal beliefs that cannot be improved with physical exercise only and directly. While other dimensions of the same scale as Body image do. And the “environment” subscale, which also shows a clear improvement for the people participating in the trial, measures items related to self-safety in the environment where physical efficiency may be only one of the complex determinants. This inspiring experience involves learning new socially recognized skills, while living in a supportive and challenging climate is an added value of the proposed route. From this point of view it is difficult to decompose the complex elements of the intervention implemented in this study to test whether the improvement is specifically due to some of them: the program involved multiple new experiences for the participants, such as learning to collaborate on a ship as a crew, experiencing community life with the crew on board, learning to use hydrophones to search for dolphins. Readers can guess what this experience might have meant ​to these people, who have missed some aspects of pleasure in their lives because of the disease. The study makes it clear how important it is for a rehabilitation program to enable a person live experiences that can restore hope in a better life. In this sense a captivating experience may interrupt the evolution into chronicity, which is sometimes favored by the scarcity of stimuli and an impaired quality of life . This is related to a new way of seeing rehabilitation in severe psychiatric disorders that exceed the concept whereby psychoses, and schizophrenia in particular, are progressive degenerative diseases with an inevitable evolution towards “defective” forms, as stated in the past in Kraepelin’s theories . The current theories have totally revolutionized this point of view. The modern concepts based on the hypothesis of an error of neurodevelopmental migration of neurons consider the biological damage at the basis of the disorder to be stable over time and not to evolve; consequentially functional improvement is possible through proper rehabilitation programs . Recently a more optimistic way to consider the possibility of recovery from these disorders has taken root. This approach sees recovery more as a personal goal than the achievement of a standardized outcome [26-28]. For a person it may mean developing hope in the future, a secure base, a network of supportive relationships, empowerment, social and work inclusion, coping skills . The recovery of a coherent and solid sense of the self has been proposed as the main element in this approach considering that illness may have broken or destroyed the awareness of self [23, 30]. Building a positive sense of self can be facilitated by experiences of interpersonal acceptance, mutuality, and a sense of belonging to a group of peers; and it is often challenging in the face of stigmatization barriers . Sports activities can enhance those components that support the process that builds a good sense of self: achieving socially-recognized sports skills, supporting self-esteem and self-confidence, discovering communication skills, favouring group membership, improving knowledge and awareness of the body [32-35]. Learning to sail - as experienced in this study - can provide added value, and facilitate recovery paths thanks to items such as: going out with a group where experts stimulate the sense of belonging; experiencing a new sense of autonomy and freedom while going out to sea and acquiring the knowledge required to manage a boat ; and specifically for the proposed program, learning new and unusual stimuli such as the sounds of marine mammals . We must stress, however, that at the follow-up, patients’ level of QoL returned to the level preceding the trial. This suggests that a more fulfilling experience for the participants may make sense only when placed in a more complex rehabilitation path. The small sample size has limited this study, anyway, the crossover design limits the power of the confounding covariates and requires fewer subjects than a parallel design , and this has partially balanced this limit. Another limit was the impossibility of a blind assessment because patients talked enthusiastically about the cruises. This is the first study to show that rehabilitation with sailing may impact positively on the quality of life of patients with severe mental disorders, albeit over a limited period of time. The study suggests that strong motivating experiences may be a useful rehabilitation tool in cronic mental disorders. Future research may explain if a motivating experience like sailing could be the first step in a planned, multimodal approach to rehabilitation. Dr FM and Dr LP have received financial support by the Regione Autonoma della Sardegna (Grant no. CRP3_165, PO Sardegna FSE 2007-2013, according to regional law L.R. 7/2007 “Promozione della ricerca scientifica e dell'innovazione tecnologica in Sardegna”). Professor MC was the senior investigator of the program. The Regione Sardegna had no further role in study design; in the collection, analysis and interpretation of data; in the writing of the report; and in the decision to submit the paper for publication. No other forms of financial support were received for this study. Mantovani G, Astara G, Lampis B , et al. Evaluation by multidimensional instruments of health related quality of life of elderly cancer patients Support Care Cancer 1996; 4: 129-40. Carta MG, Aguglia E, Caraci F , et al. Quality of life and ur-ban/rural living preliminary results of a community survey in Italy Clin Pract Epidemiol Ment Health 2012; 8: 169-74. Bazzichi L, Maser J, Piccinni A , et al. Quality of life in rheumatoid arthritis impact of disability and lifetime depressive spectrum symptomatology Clin Exp Rheumatol 2005; Nov-Dec 23(6): 783-8. Mantovani G, Astara G, Lampis B , et al. Impact of psychosocial interventions on quality of life of elderly cancer patients Psycho-oncology 1996; 5: 127-35. Carta M, Mura G, Sorbello O, Farina G, Demelia L. Quality of life and psychiatric symptoms in wilson's disease the relevance of bipolar disorders Clin Pract Epidemiol Ment Health 2012; 8: 102-9. Carta M, Ruggiero V, Sancassiani F , et al. The use of antidepressants in the long-term treatment should not improve the impact of fibromyalgia on quality of life Clin Pract Epidemiol Ment Health 2013; 9: 120-4. Higgins A, Callaghan P, DeVries J , et al. Evaluation of mental health recovery and Wellness Recovery Action Planning education in Ireland a mixed methods pre-postevaluation J Adv Nurs doi 101111/j1365-264805937x Epub 2012, Jan 25 2011; 2012 68(11): 2418-28. Hardoy MC, Seruis ML, Floris F , et al. Benefits of exercise with mini tennis in intellectual disabilities effects on body image and psychopathology Clin Pract Epidemiol Ment Health 2011; 7: 157-60. Mura G, Moro MF, Patten SB, Carta MG. Exercise as an add-on strategy for the treatment of major depressive disorder a systematic review CNS Spectr 2014; Mar 3: 1-13. Carta MG, Maggiani F, Pilutzu L , et al. Sailing for rehabilitation of patients with severe mental disorders results of a cross over randomized controlled trial Clin Pract Epidemiol Ment Health 2014; 10: 73-9. Ramon S, Healy B, Renouf N. Recovery from mental illness as an emergent concept and practice in Australia and the, UK Int J Soc Psychiatry 2007; 53(2): 108-22. World Health Organisation In: International Classification of Diseases (ICD) 10th Revision (ICD-10) Geneva WHO 1990 . World Health Organization In: WHOQOL Group 1998 Development of the World Health Organization WHOQOL-BREF quality of life assessment Psychol Med. 551-8. World Health Organization WHOQOL-Bref Introdution administration, scoring and assessment of the generic version field trial version Geneva 1996..
 De Girolamo G, Rucci P, Scocco P , et al. Quality of life assessment validation of the Italian version of the WHOQOL-Bref Epidemiol Psichiatr Soc 2000; 9: 45-55. Katki HA. Invited commentary evidence-based evaluation of p values and Bayes factor Am J Epidemiol 2008; 168: 384-8. Knöchel C, Oertel-Knöchel V, O'Dwyer L , et al. Cognitive and behavioural effects of physical exercise in psychiatric patients Prog Neurobiol 2012; Jan 96(1): 46-8. Helmich I, Latini A, Sigwalt A , et al. Neurobiological alterations induced by exercise and their impact on depressive disorders [corrected] Clin Pract Epidemiol Ment Health 2010; Nov 30 6: 115-25. Vancampfort D, De Hert M, Sweers K, De Herdt A, Detraux J, Probst M. Diabetes, physical activity participation and exercise capacity in patients with schizophrenia Psychiatry Clin Neurosci 2013; Sep 67(6): 451-6. Abdel-Baki A, Brazzini-Poisson V, Marois F, Letendre E, Karelis AD. Effects of aerobic interval training on metabolic complications and cardiorespiratory fitness in young adults with psychotic disorders a pilot study Schizophr Res 2013; Sep 149(1-3): 112-5. Carta MG, Agaj A, Harapej E , et al. Outcomes of discharged females versus those waiting for discharge from Vlore Psychiatric Hospital (Albania) Int J Soc Psychiatry 2013; Nov 59(7): 682-9. Kraepelin E, Ed. Dementia Praecox and Paraphrenia Lenox MA: Hardpress Publihing 2013. Mura G, Petretto DR, Krishna MB, Carta MG. Schizophrenia from epidemiology to rehabilitation Clin Pract Epidemiol Ment Health 2012; 8: 22-7. Silverstein SM, Bellack AS. A scientific agenda for the concept of recovery as it applies to schizophrenia Clin Psychol Rev 2008; 28: 1108-24. Nordén T, Malm U, Norlander T. Resource Group Assertive Community Treatment (RACT) as a tool of empowerment for clients with severe mental illness a meta-analysis Clin Pract Epidemiol Ment Health 2012; 8: 144-51. Carta M, Sancassiani F, Lecca M , et al. Coping with the crisis people with severe mental disorders acting for social change through sustainable energy Clin Pract Epidemiol Ment Health 2013; Nov 28 9: 214-20. Sells DJ, Stayner DA, Davidson L. Recovering the self in Schizophrenia an integrative review of qualitative studies Psychiatr Q 2004; 75(1): 87-97. Carta MG, Balestrieri M, Murru A, Hardoy MC. Adjustment disorder epidemiology, diagnosis and treatment Clin Pract Epidemiol Ment Health 2009; 5: 15. Dunn EC, Wewiorski NJ, Rogers ES. The meaning and importance of employment to people in recovery from serious mental illness results of a qualitative strudy Psychiatr Rehabil J 2008; 32: 59-62. Carta MG, Hardoy MC, Pilu A , et al. Improving physical quality of life with group physical activity in the adjunctive treatment of major depressive disorder Clin Pract Epidemiol Ment Health 2008; 26: 1. Pilu A, Sorba M, Hardoy MC , et al. Efficacy of physical activity in the adjunctive treatment of major depressive disorders preliminary results Clin Pract Epidemiol Ment Health 2007; Jul 9 3: 8. Hegemann T. Rehabilitative success of a social therapy sailing project Prax Kinderpsychol Kinderpsychiatr 1991; 40(2): 61-6. Basil B, Mathews M. Human and animal health strengthening the link methodological concerns about animal facilitated therapy with dolphins BMJ 2005; 331: 1407. Jone BK, Michael G, Eds. Design and analysis of cross-over trials London: Chapman and Hall 2003.